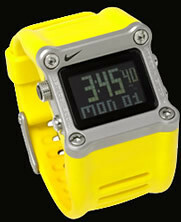 Nike's Hammer watch is tougher than a pitbull with a titanium codpiece. It can survive almost anything Mother Nature can hurl at it, barring a volcanic eruption - it'll withstand seriously heavy shocks and is water resistant up to 50m. The Nike Hammer hits UK shops in early September for £100.